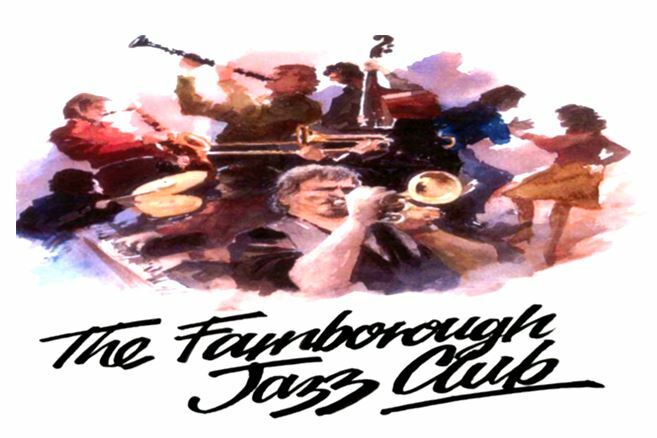 TONY PITT’S ALL STARS certainly is a most exciting band and entertained us here ‘big time’ at the Farnborough Jazz Club on Friday, 15th August 2014. Wherever you see this band advertised, definitely go see them, you won’t regret it. Tony always books some of the top musicians in British Jazz. This evening Tony brought with him ALAN GRESTY on trumpet, GRAHAM HUGHES on trombone, AL NICHOLS on soprano and tenor saxes, ANDY LAWRENCE on double bass, JOHN ELMER on drums and of course TONY again ‘solid as a rock’ on banjo. Tony does a wonderful job of introducing everything, quite a natural on the ‘mike’. The band began the evening with Graham singing ‘All of Me’, such a great start. My next choice of song was ‘Tishomingo Blues’, with Graham playing harmonica and Al on soprano sax. ‘Alice Blue Gown’ gave us the chance to do our line dance (including a few jivers on the floor too). Alan has a wonderful voice and sung to ‘When I Grow Too Old to Dream’. I wrote ‘fab clarinet’, although I know they were all fabulous (am I gushing too much, sorry can’t help it). ‘Bourbon Street Parade’ was certainly a temptation for a brolly parade, so Steve, one of our regulars, got out his collection of ‘umbrellas’ from the car, which produced another bit of fun. Al (Nichols of course) featured on sax with an Al Jolson hit, ‘(I met my love in) Avalon’, Oh what a performance, just superb. Talented Graham was next to be featured with ‘Just a Gigolo’ he played harmonica and also sang. I remember dancing, when John played a magnificent drum solo (you don’t forget drum solos if you are dancing – and I love to dance to drum solos! ), anyhow a lovely number. ‘Everybody Loves My Baby’ must be mentioned, with Alan playing flugelhorn (I just love that instrument), plus he also sang. They once again played way past time and finished up with ‘Dixie (I Wish I was in)’ intermingled with a rendition of ‘When the Saints Go Marching In’. Oh what an ending. Certainly everyone left with huge smiles of appreciation and plenty of praise, not wanting it to end. That is how we love it, everyone leaving wanting more, so see you next Friday, with ‘Baby’ Jools’ Jazzaholics. Nothing like ‘live’ music, especially jazz. *‘When the Saints Go Marching In’ – origins unknown (derived from (l) Katherine Purvis, (m) James Milton Black 1896) re-publ 1927. This entry was posted in Tony Pitt's All Stars on August 17, 2014 by Diane.